being pretty-an indian girl's blog: All about Scrubs! What is scrubbing i.e. Exfoliation? Exfoliation involves the removal of the oldest dead skin cells on the skin's outermost surface, and has been used for many years to help maintain skin. Exfoliation is involved in the process of all facials, during microdermabrasion or chemical peels at medical spas. Exfoliation can be achieved through mechanical or chemical means. Credit is given to the ancient Egyptians for the practice of exfoliation. In the Middle Ages, wine was used as a chemical exfoliant, with tartaric acid as the active agent. In Asia, the practice of exfoliation started hundreds of years ago. The etymology of the word exfoliate comes from the Latin exfoliare (to strip off leaves). Excessive scrubbing and rubbing as well as exfoliating can damage the skin, so one should not do so on a daily basis unless using an extremely mild homemade scrub. While scrubs are said to slough off dead and dry skin, we often overdo that. Some scrubs that have mineral oils, synthetics (abrasive beads made of plastic) or chemicals that can be harmful if you skin is sensitive. If the skin has a cut or bruise, then avoid using a salt body scrub as it will aggravate the condition and burn the skin. But be careful when rubbing the body with a scrub product, especially natural ingredients mixed by yourself, because it actually makes the skin becomes wrinkled. There’s nothing wrong with the body scrubbing, however if you do that in the wrong way, it create the new problem to your skin. Wrong scrubbing is rubbing the skin with a up and down strong pressure onto the skin. If we massage and scrub with correct technique to the body and face, it will maintain our skin elasticity. But if we do that in the wrong way, it makes the skin so easily loosened. The skin also be irritated too. So how to do the right scrubbing so we can get the benefit of it? Move your hand turn from the ground up as a scrub, in a clockwise direction and leads to the heart. Movement will tighten the skin. Knowing how to properly scrubbing provides more effective results for the skin. The advantage to the body is dead skin cells will be lost, the skin become smoother and more toned and radiant. Scrubs made with natural ingredients such as sugar, salt, carrier oils, honey work, assuming you are not over doing it. Also choose natural oils such as sweet almond oil, Jojoba and Avocado oil. These natural ingredients are great for the skin. Specialists believe one should choose their scrubs based on the type of skin, sensitivity of skin, frequency of use and process. Whipped scrubs are also great as the particle sizes of the exfoliants are much smaller and are better for sensitive skin. Try a grated coconut pack mixed in coconut water or crushed almond and mint leaves; it will cleanse the skin well. Sugar: It is considered gentle as it has smoother edges than salt. It can be great for sensitive skin. Apricot kernels: Rich in vitamin A, which is vital for healthy skin, they are perfect for elbows, backs, heels and thicker skins. Nutshells and fruit kernels can have jagged edges so they aren't ideal for sensitive skin. Honey: As a moisturizer, honey is an apt skin softener and can nourish the skin. It can be used in combination with oatmeal. 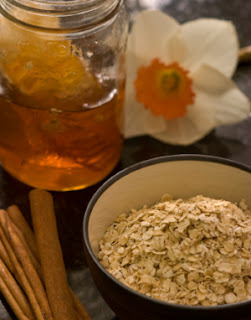 Oatmeal: A gentle grain, oatmeal moisturizes skin. It is able to reduce inflammation in sensitive skin. Mix together and apply gently on skin. My Make-Up Wishlist May 2012!! Some New Product Launches in India!